Promoting retail business is quite challenging. Marketers face the daunting task of devising ways to cut through the cacophony of the overcrowded market place and hold aloft the business entity that can grab eyeballs. There is too much commotion in the market place where every business is trying its best to hold its head above the rest and be visible. Although visibility is the primary goal, the actual business happens when you can engage customers and provide them the best experience in shopping or eating, as the case may be. However, unless you can get a toehold to publicize the business you just cannot think of engaging customers. With technology providing more options today, digital signages have high capabilities in cutting through the noisy environment to place your business on the high pedestal of visibility. It draws the attention of potential buyers who can make sales happen. Digital signages are perfect for use as interactive communication boards to convey messages to target customers to realize some business goals. Depending on the place of its use — outdoor or indoor and the target audience, you can make use of the signage in many different ways. However, the essence of communicating with the audience, keeping them engaged and influencing their decision-making process that leads to purchasing, remains the same in all cases. In this article, you will find the reasons why digital displays are so important for businesses. There was a time when some types of businesses used to arrange for entertaining customers, as they had to wait for receiving services, like at an automobile service center. As customers were compelled to idle away their time, to keep them in good humor and provide a better experience in hospitality, businesses made use of televisions to keep them entertained. Sports programs, musicals, and news were the staple choice for entertaining guests, but never there was any talk about business. With the advent of digital signage, the scene changed drastically. Companies are replacing television programs with digital displays and using it to promote their business through messages that would be of interest to the waiting customers. Special offers and discounts for customers pave the way for building better relationships. Static displays are boring, to say the least, and its appeal is quite small as compared to dynamic messages on digital signage. It takes a good amount of time, labor and cost to produce a static display, whereas dynamic displays are faster to create, more economical and done with less labor. Dynamic displays save the recurring expense involved in replacing static displays frequently to suit varying business needs. Updating a digital sign just requires a few steps that anyone can do with ease. It offers more scope and ease of keeping in tune with the quickly changing business needs. You will find its best application in restaurants that use digital menu boards. Menu boards are extremely important for restaurants because it creates a channel of communication with the customers that form the backbone of the business. The live interaction between the restaurant and customers is possible only because of the menu. How much business can happen depends a lot on the extent of display on the menu board that lets the customer know about what is on offer for them. The digitized menu boards have replaced traditional menu cards in most restaurants as business owners are eager to capitalize on the opportunities of brand building that comes along with it. 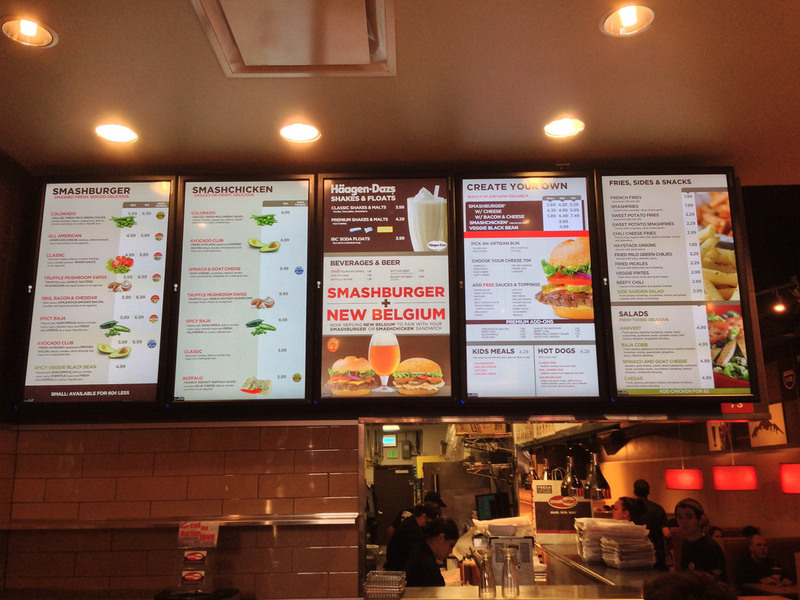 The digital menu board aids in getting close to the customer, which is the first step in building brands. The boards provide the scope for interactive communication with clients who take the brand building exercise further ahead. Over and above, menu boards contribute to the business bottom line. When you are traveling on the roads, you must have experienced how quickly your eyes turn to the glowing digital signages. It happens because our brains are more receptive to dynamic displays than static images. As a result, we have a greater affinity of turning to moving displays. The videos displayed on digital signages significantly impacts the minds of users who find reason enough to respond to it. It invites attention more compellingly and leaves a long lasting effect on viewers, as dynamic images are quicker to retrieve during the recall. Since you can change digital signs whenever you like, you can use it in many different ways in different circumstances. During an emergency, when it is required to communicate valuable information to customers, employees, and guests, that is vital for alerting them, digital signs are most useful. It provides life-saving information during disasters that guide people to safety. Some digital signages have the facility of displaying local alerts like storms and torrential rains and other weather related information. This you can do by availing the third party facility of Emergency Alert System. In this system, besides displaying the alert message on the signage, you can send text messages to specific recipients about the real time information. Digital signages support the dynamic scenario of the workplace and provide a powerful channel of communication with workers and employees. In a workplace like in factory where people do not have easy access to computers at all places, it is simpler to communicate relevant information across the length and breadth of the location by using digital signs. Whether it relates to the production process, health and safety or logistics, it can be flashed on the digital boards and make people aware instantly. Quick messaging helps to make impromptu changes in the production process that can increase the efficiency of the process as well as individuals. It can also contribute to maintaining a more safe and healthy working environment. The results of communication through digital signs have a deep impact on business in all areas and not sales alone. Although the system is installed with sales in mind, have many other allied benefits that give a better return on investment. Trudy Seeger is a digital marketing consultant. He is attracted to the powers of electronic signs that have taken the marketing world by storm. A sky gazer, he is also drawn to astronomy.